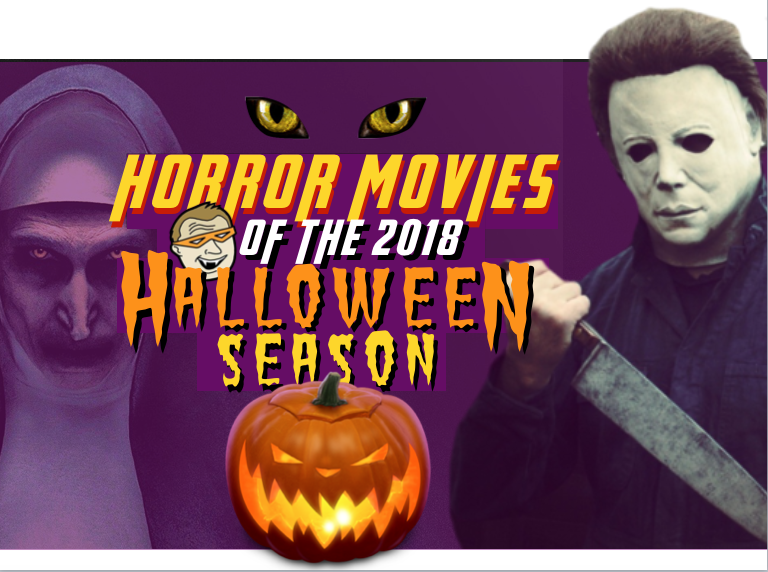 Here, now, is our official Guide to the Horror Films of the 2018 Halloween Season. This does not include Netlx, Amazon or any other streaming service–these are the big films that will be hitting a movie theater near you. Aug. 10 – The Meg: This bad boy has already arrived in theaters, terrorizing the deep in ways we haven’t seen since…. JAWS. Yeah, I know, we have had a few shark movies since then (47 Meters Down; Deep Blue See; and the Blake Lively The Shallows. ), but none of them delivered the giant pop-culture wallop that Jaws did back in 1975… and guess what? The Meg doesn’t seem to be setting the box-office on fire either. But who cares? It’s fluffy popcorn fare. It’s basically a bigger, longer, meaner Jaws — but will there ever be a shark movie that doesn’t have to swim out of Jaws’ shadow? Either way, all you have to now is Jason Strathom fights a giant prehistoric shark called a Megalodon (thus the name MEG). That’s enough to get me into theaters. Aug. 10 – Slender Man: As anyone who’s seen our show (or read our website) knows, for some time now I’ve been obsessed with this Slender Man phenomenon. It’s just so fascinating to me that a completely fake and made-up story has gripped the imagination of so many people (he is fake, right?). For a complete backstory on Slender Man and the horrible, terrifying effect he had on some gullible young girls, check out our postings on the subject. But suffice it say that a creature of unfathomable eeriness was created whole cloth from a creepy pasta post online, he worked his way into the public consciousness, and now he’s got a movie of his own. Aug. 10 – Summer of 84: If you loved Stranger Things, then this film is for you! After suspecting that their police officer neighbor is a serial killer, a group of teenage friends spend their summer spying on him and gathering evidence, but as they get closer to discovering the truth, things get dangerous. Aug. 31 – The Little Stranger: After a doctor is called to visit a crumbling manor, strange things begin to occur. A very British tale (read: kinda slow and full of manners and manors), the trailer doesn’t give too much of the plot away. Aug. 31 – Blood Fest: Fans flock to a festival celebrating the most iconic horror movies, only to discover that the charismatic showman behind the event has a diabolical agenda. As festival attendees start dying off, three teenagers – more schooled in horror-film cliches than practical knowledge about neutralizing psycho killers – must band together and battle through various madmen and monstrosities to survive. Aug. 31 – Boarding School: a “troubled” 12-year-old boy, Jacob Felsen, is sent away to a boarding school where he finds every kid’s worst nightmare: a lonely deserted mansion filled with other misfits and two menacing teacher who are clearly hiding a few secrets. Sept. 7 – The Nun: When a young nun at a cloistered abbey in Romania takes her own life, a priest with a haunted past and a novitiate on the threshold of her final vows are sent by the Vatican to investigate. Together, they uncover the order’s unholy secret. This is the latest installment in the Conjuring universe of films, a spooky series under the Blumhouse banner that has managed to deliver some very real chills. Sept. 14 – The Predator: From the outer reaches of space to the small-town streets of suburbia, the hunt comes home. Now, the universe’s most lethal hunters are stronger, smarter and deadlier than ever before, having genetically upgraded themselves with DNA from other species. When a young boy accidentally triggers their return to Earth, only a ragtag crew of ex-soldiers and a disgruntled science teacher can prevent the end of the human race. Sept. 14 – Patient Zero: A supervirus has turned humankind into highly intelligent, streamlined killers, and an asymptomatic victim (Matt Smith) who can communicate with the infected must lead the last survivors on a hunt for Patient Zero and a cure. Sept. 14 – Mandy: The quiet life of devoted couple Red (Nicolas Cage) and Mandy (Andrea Riseborough) takes a dark and bizarre turn when a nightmarish cult and their maniacal leader (Linus Roache) seek to possess Mandy…body and soul. Sept. 21 – The House with a Clock In Its Walls: Ten-year-old Lewis goes to live with his uncle in a creaky old house that contains a mysterious ticktock noise. When Lewis accidentally awakens the dead, the town’s sleepy facade magically springs to life with a secret world of witches and warlocks. Sept. 28 – Hell Fest: A masked serial killer turns a horror themed amusement park into his own personal playground, terrorizing a group of friends while the rest of the patrons believe that it is all part of the show. Oct. 5 – Venom: When Eddie Brock acquires the powers of a symbiote, he will have to release his alter-ego “Venom” to save his life. Oct. 12 – Goosebumps 2: Haunted Halloween: Halloween comes to life in a brand-new comedy adventure based on R.L. Stine’s 400-million-selling series of books. Oct. 19 – Halloween (2018): Jamie Lee Curtis and John Carpenter return to Haddonfield, and they return back to the story that made both of them household names — HALLOWEEN. Forty years after that fateful night of babysitting, Laurie Strode is about to have a final showdown with the guy who is no longer her brother (that came in Halloween 2, which–apparently–never happened in this timeline). THIS is the most anticipated horror film of the year. Please please please let it be good. Judging by the sneak peak scene we saw at Comic-Con, this is shaping up to be bloody good! Oct. 26 – Overlord: J.J. Abrams and Nazi zombies. Nuff said. Nov. 2 – Suspiria: A darkness swirls at the center of a world-renowned dance company, one that will engulf the troupe’s artistic director, an ambitious young dancer, and a grieving psychotherapist. Some will succumb to the nightmare. Others will finally wake up. This is a remake of an earlier Suspiria from 1977.